St James is an attractive 13th and 14th-century country church in Early English style. 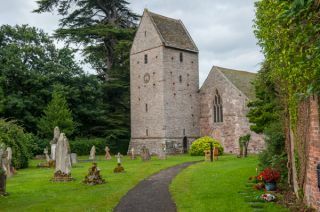 The most immediately apparent attraction at Kinnersley is the striking saddleback tower, which situated at the north-west angle of the nave. A blocked Norman doorway is set into the body of the church near the tower entrance with a huge Perpendicular window above the arch. This is a very square, upright structure, terminating, rather unusually for a Herefordshire church, in a steep gable roof - no parapets, no spire, just a gable that looks as if it could happily exist on a [small] manor house. The style is reminiscent of the Dutch 'saddleback' style of architecture. The body of the church consists of a nave, chancel, and side aisles. The interior was much restored in 1867-8 by the rector, Reverend Andrews, to a design by GF Bodley. There is a wooden reredos of oak, recently painted and re-gilded. The interior boasts a 15th-century memorial brass to rector William Leviot, who died in 1421, and a very fine Jacobean monument to Francis Smallman (d. 1633), lord of the manor at Kinnersley. He is portrayed with his wife Susan, kneeling under a canopy held aloft by cherubs, while beneath, the couple's six offspring are aligned in suitably pious poses. Below the Smallman monument is a memorial brass to a medieval rector, William Leviot (d. 1421). At the west end of the nave is a large monument to Lady Ann Morgan (d. 1794). This was designed by sculptor Nicholas Read, who apparently worked on the piece from 1749 until his death in 1787). Another vaguely classical memorial is a Greek Revival monument to John Parkinson (d. 1804) in the north aisle. The pulpit is decorated with carved panels depicting allegorical figures. These are thought to be Flemish and dated to around 1530. There is also very nicely carved Jacobean panelling behind the altar. Beside the church stands Kinnersley Castle, a Norman fortress later rebuilt as an Elizabethan manor house by the powerful Vaughan family.